ABLE offer the ILT400 Belt Radiometer, equipped with a solid-state detector for long term stability and reduced cost over traditional vacuum phototubes. 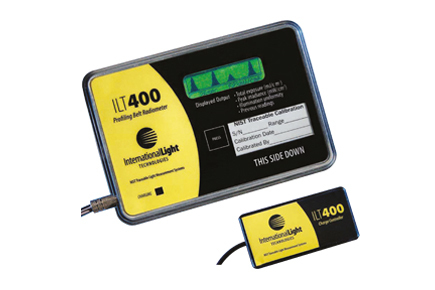 The ILT400 all-in-one Belt Radiometer, comes in three versions: ILT400UVA measures UVA from 315 – 390 nm, ILT400BAV is designed for broadband covering 275 – 485 nm, and the ILT400UVV peaks in the visible spectrum covering 390 – 475 nm. The ILT400 works with many lamp options from UV LEDs, Iron doped, H and D type lamps, as well as standard UV bulbs, but is not recommended for flashing or pulsed lamps. Graphically displays the performance of each lamp and reflector in your system. A stored reference plot allows you to compare, on-the-spot, the current performance of the system with the base line. The information is provided instantly. and allows the operator to see the uniformity of the illumination.